My first post about our holiday in Denmark over Christmas and New Year featured where we stayed, walking trails and our home-cooked meals. This is Part 2, covering eating out and the beaches we visited. 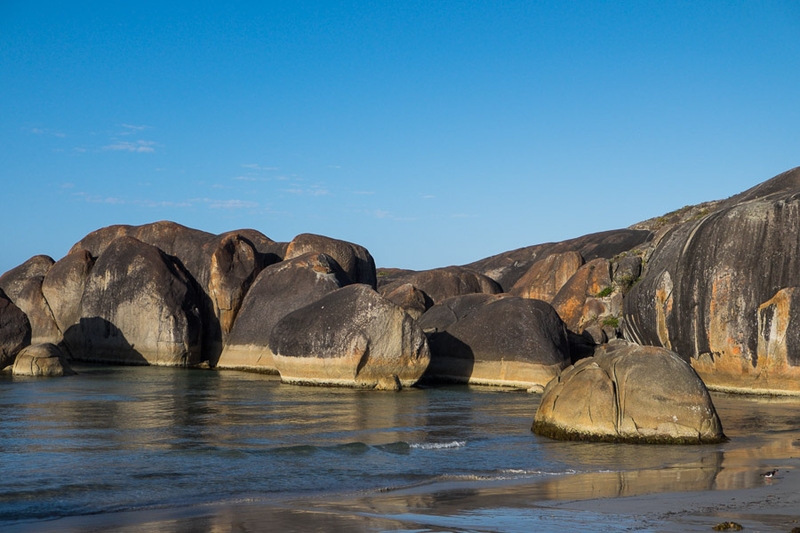 Denmark is home to some of Western Australia’s most stunning beaches. 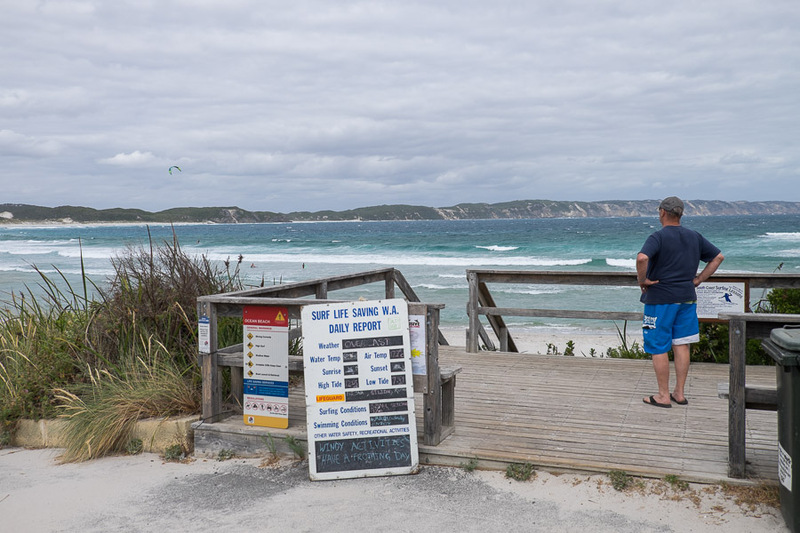 The most popular swimming beaches (Greens Pool, Ocean Beach) can get extremely busy during the holiday season – you’ll know as soon as you hit the car park. If you want to avoid crowds, it’s best to go early morning. No matter how cool or warm the day is, the water is icy cold. 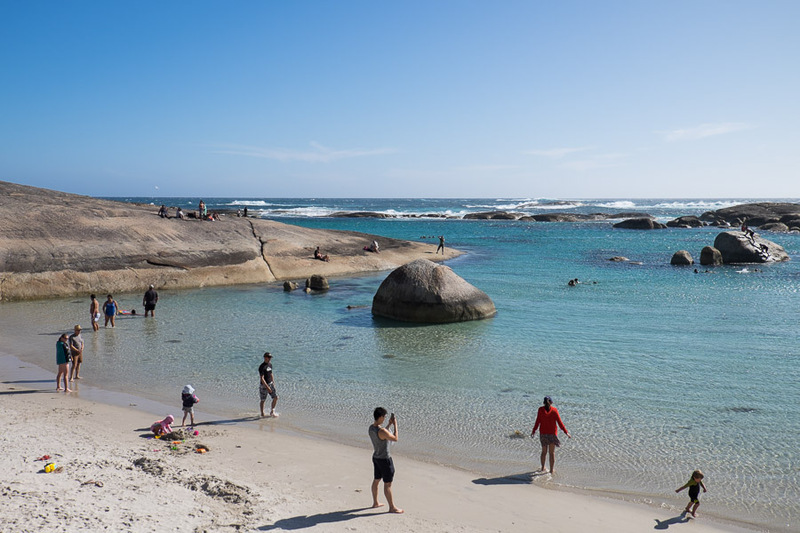 Greens Pool is very popular as a swimming beach, pristine water surrounded by rocks that create a sheltered, calm place to swim. 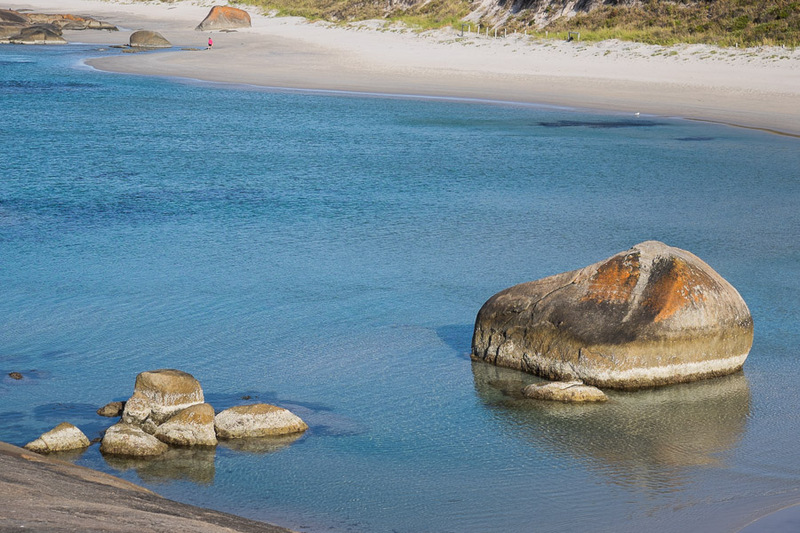 It’s absolutely stunning and one of our most recognisable beaches – once seen, never forgotten. Another view of Greens Pool. 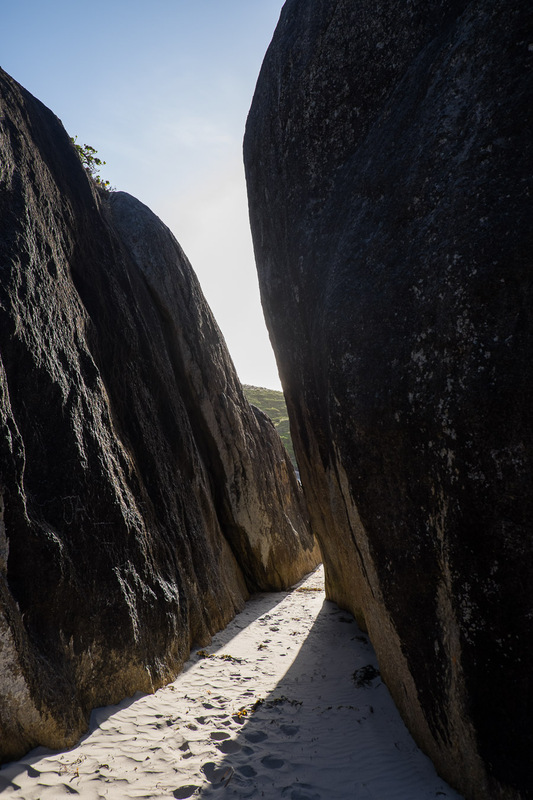 Elephant Rocks – the huge granite boulders resemble a herd of elephants. 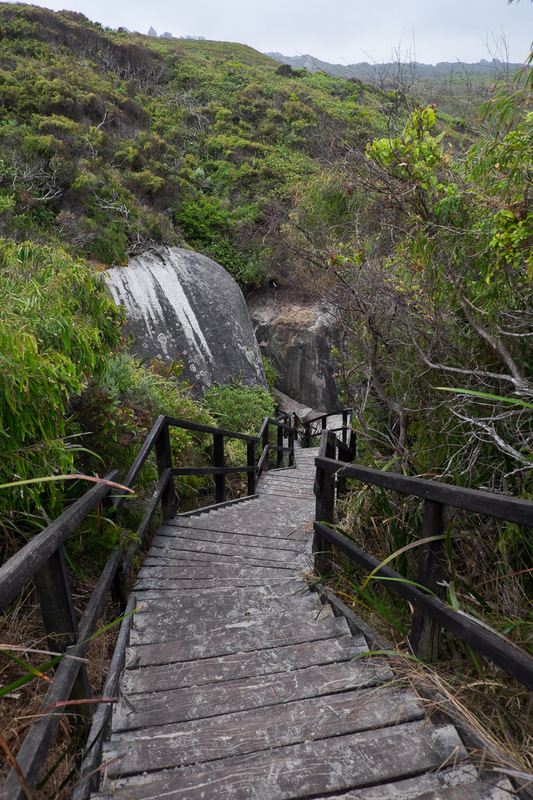 After walking down the wooden stairs, walk through the gap between these boulders to get to Elephant Cove to access the beach and get another view of the Elephant Rocks. Grey morning at Elephant Cove beach. Can you see the ‘baby elephant’? Jac knew I wasn’t happy with my photographs from that grey drizzly morning at Elephant Rocks and suggested we get up early and go back on our final morning in Denmark. I had a bright blue sky this time, though the water was just as cold! 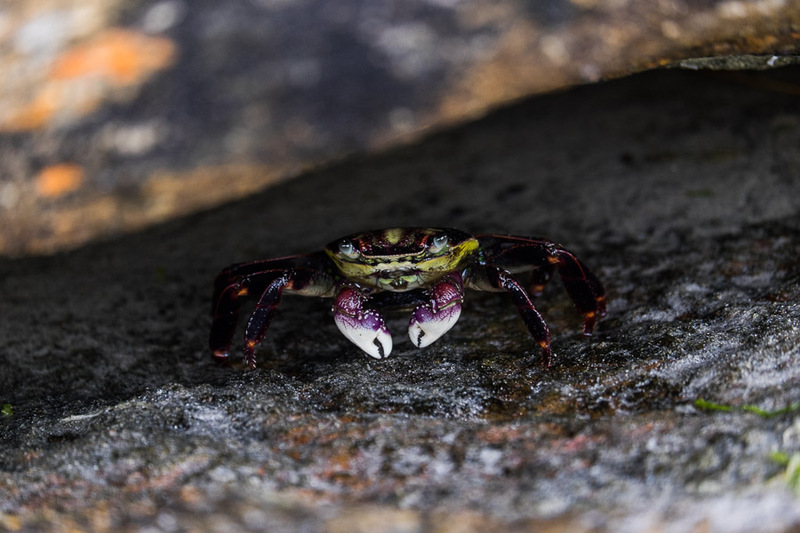 Elephant Cove Beach. 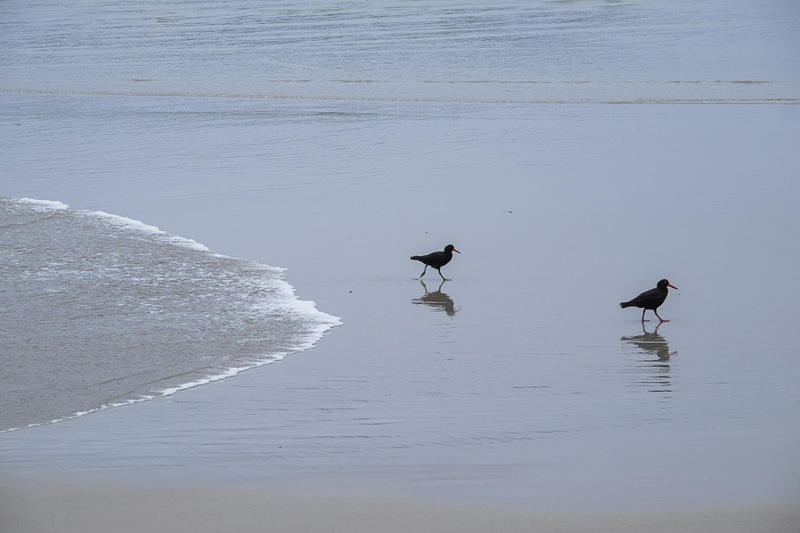 The currents can be deceptively strong here, so be careful. 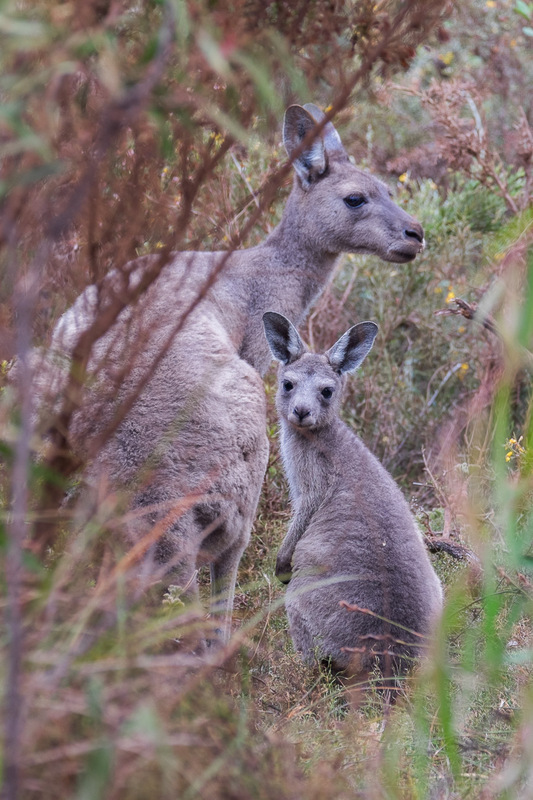 On our way to Madfish Bay, we spotted a kangaroo and joey in the bushland next to the road. Jac stopped the car and I photographed them through the window with my longest zoom lens. 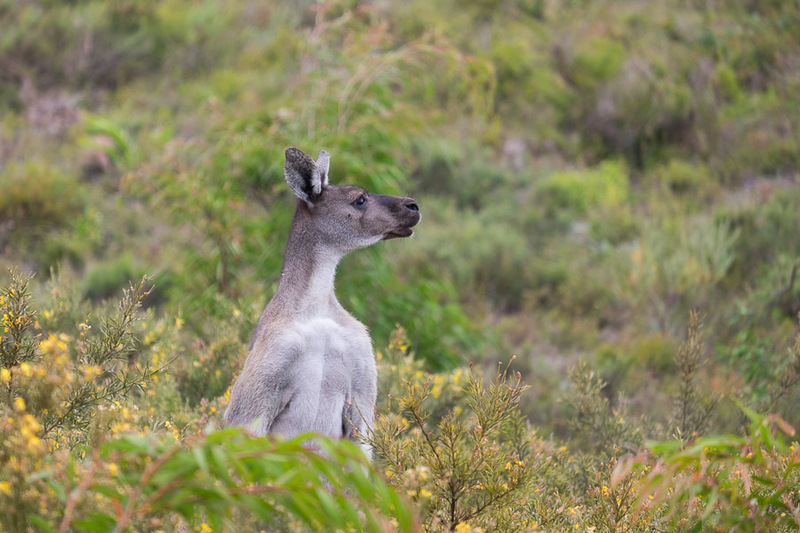 In the bushland on the other side of the road, another roo. I only managed to take this photo before he bounced off. 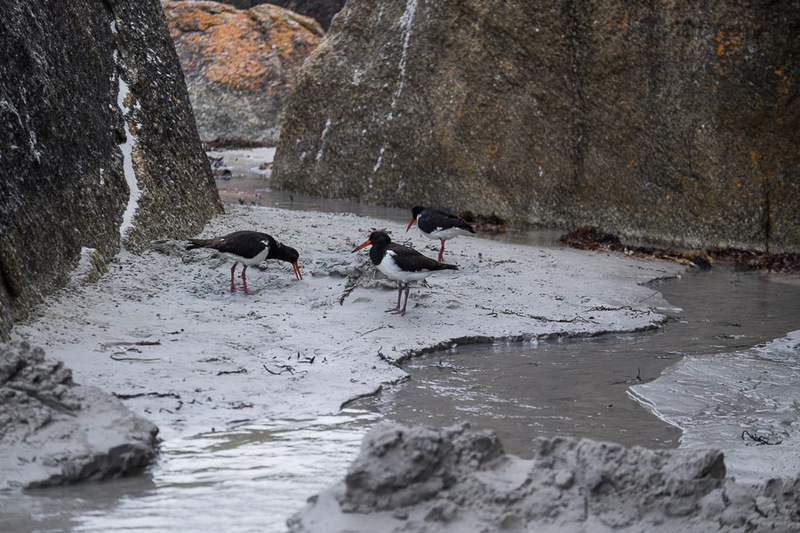 Oyster Catchers at Madfish Bay. 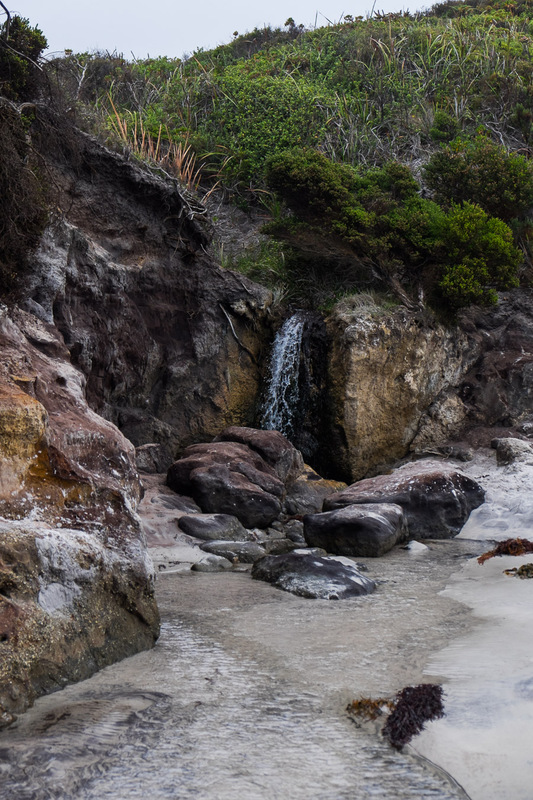 The freshwater waterfall at Waterfall Beach. 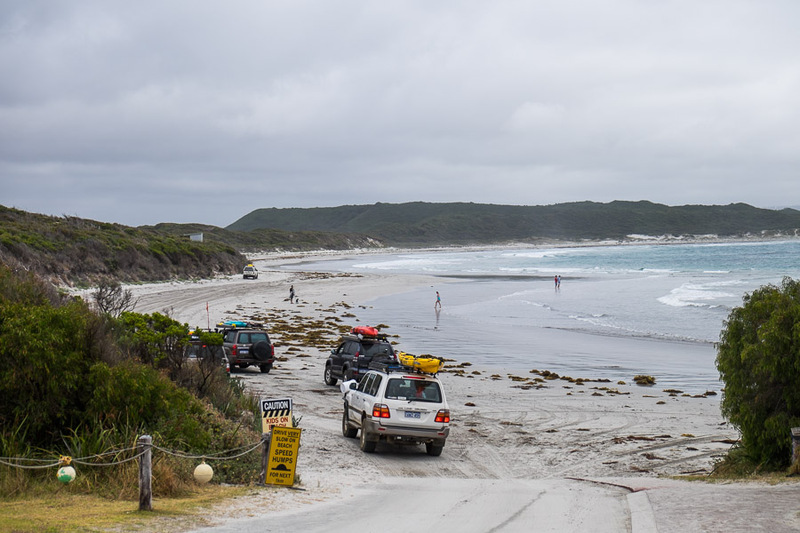 4WD vehicles are allowed on Parry Beach. The beach is next to the Parry Beach Campground. There are public toilets here. We made sandwiches using Christmas leftover meats and cheese and froze them. 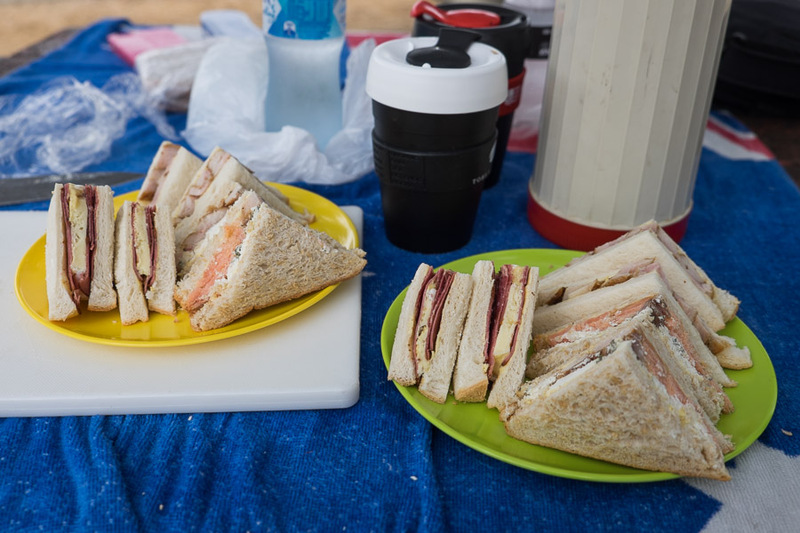 We brought them to Parry Beach with a thermos of tea for a picnic a few days later – smoked salmon and salt bush goat cheese; pastrami and French-style triple cream cheese; salt and pepper chicken with mayonnaise. It was extremely windy at Ocean Beach the day we stopped by. 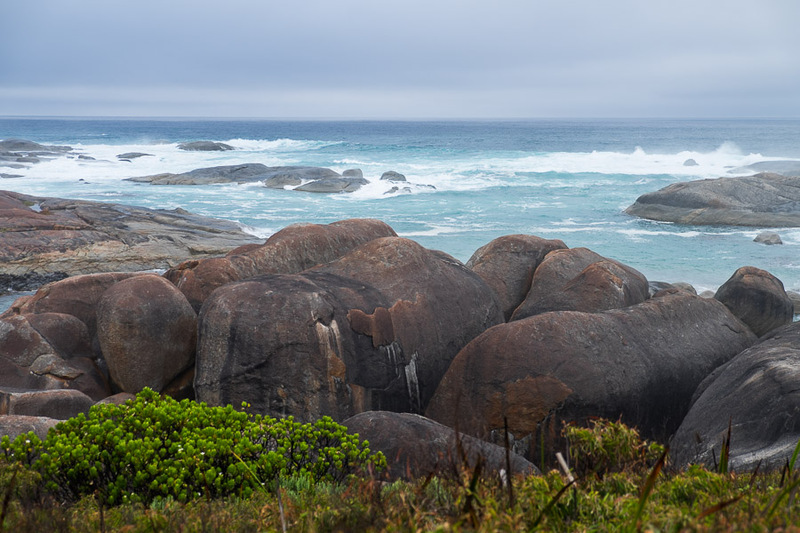 Located between Wilson Inlet and the Great Southern Ocean, it’s very popular with surfers. On this day, the surf life saving daily report for Ocean Beach recommended “Windy activities”. Lights Beach is one of the closest beaches to Denmark town but with its strong rips, is not known as a swimming beach. 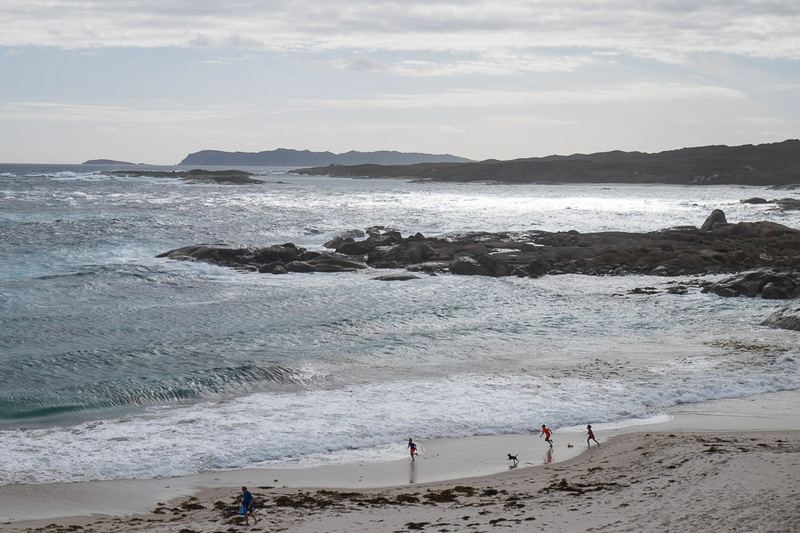 It’s a great place to watch the waves (there’s even a lookout at the carpark), and walkers can access William Bay National Park and the Bibbulmun Track from here. 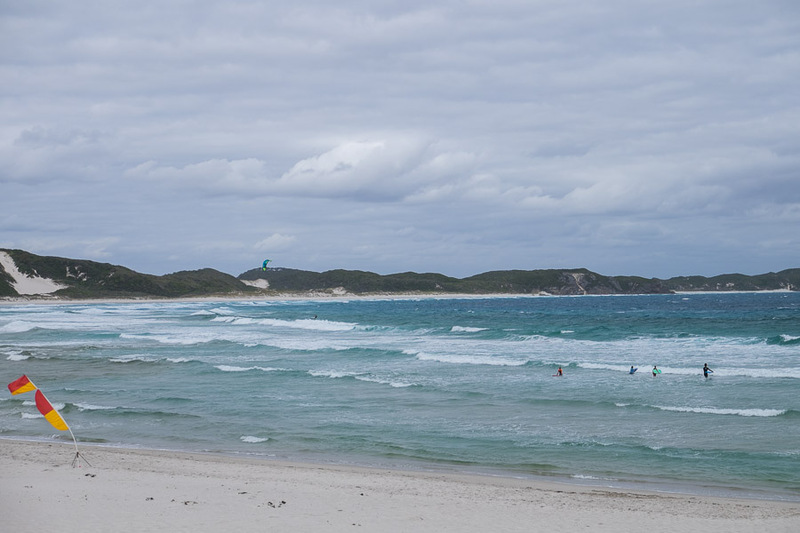 Ocean Beach and Lights Beach are closest to Denmark town; Greens Pool, Elephant Rocks/Elephant Cove, Waterfall Beach, Madfish Bay and Parry Beach are located within the area known as William Bay National Park (around 16 km west of Denmark town). 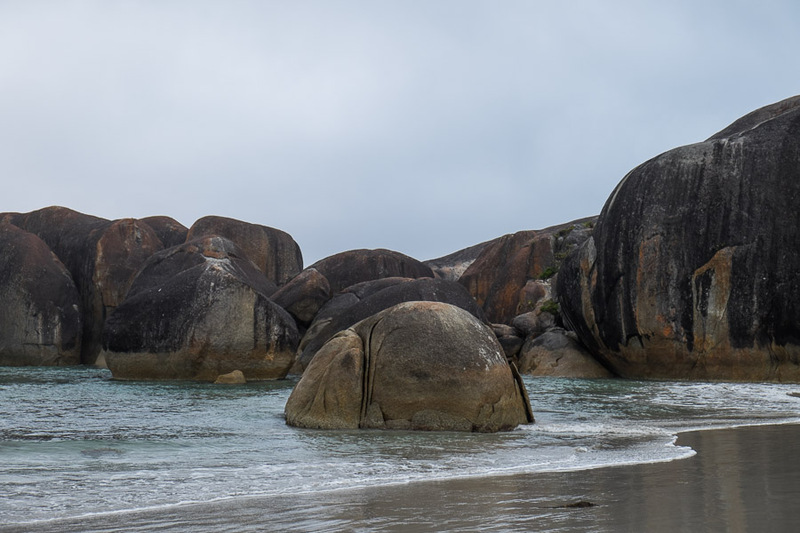 Greens Pool and Elephant Rocks are within walking distance of each other and highly recommended. 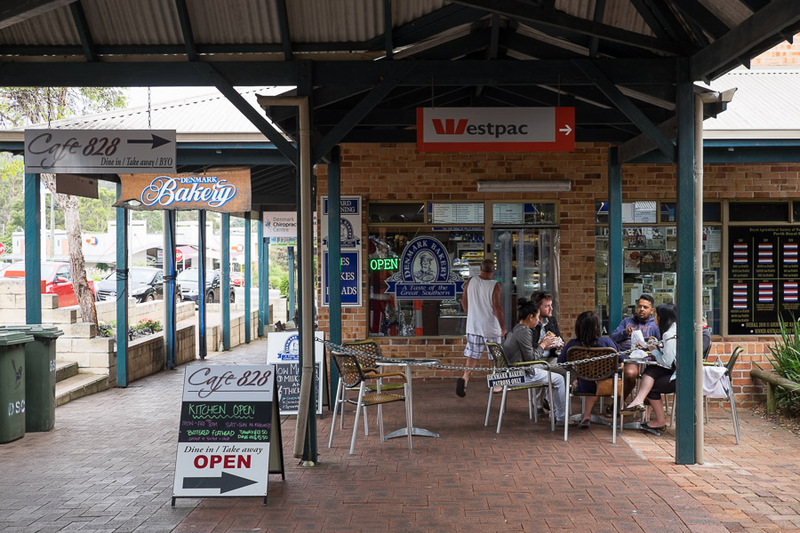 I always look forward to eating a pie (or pies) at a country town bakery. 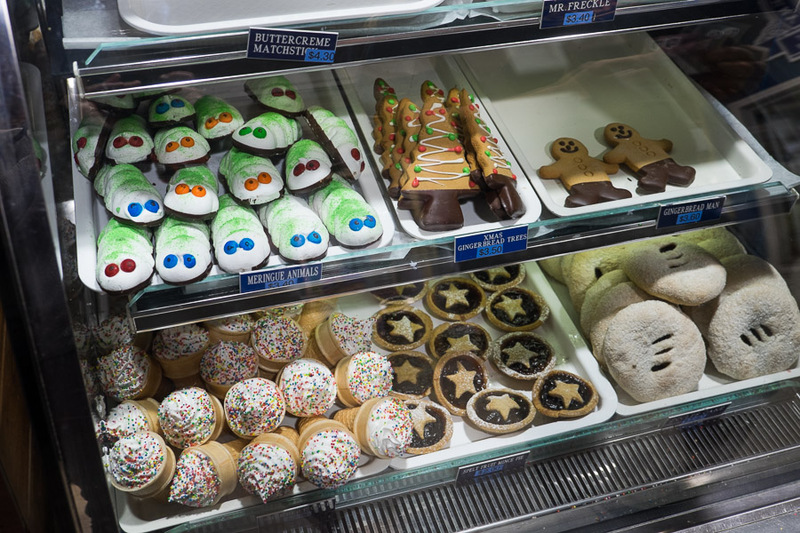 There are two bakeries in Denmark town. We visited them a couple of times each. 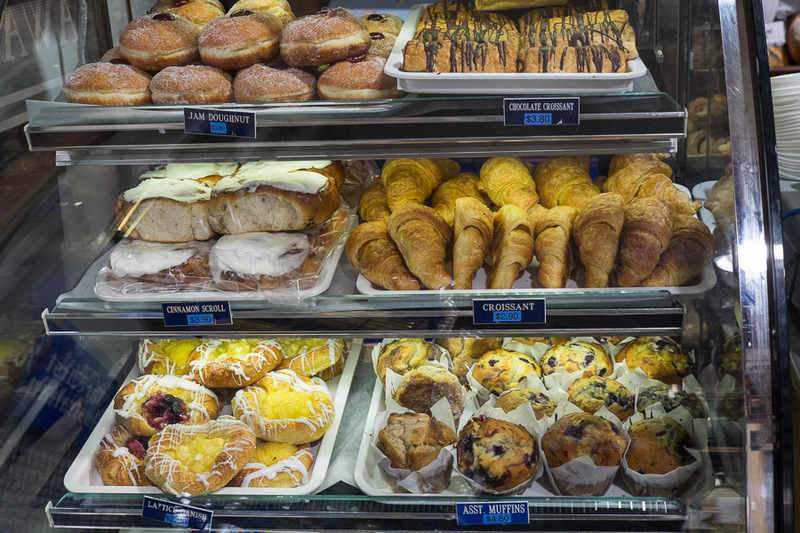 First, we visited Strickland Hot Fresh Bread. 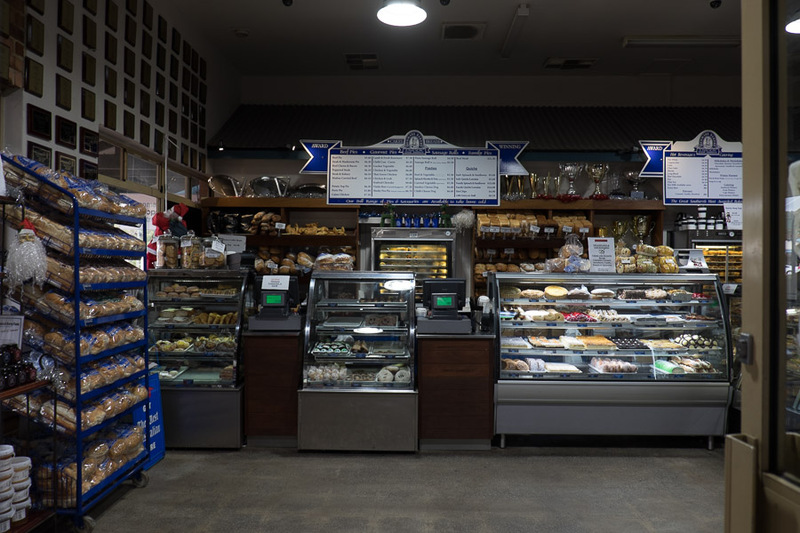 As well as the usual range of fresh bread, sweet treats, pies and sausage rolls, they do breakfast (full fry-up, bacon and eggs, pancakes) and lunches (fish and chips, Chinese takeaway, salads and wraps). 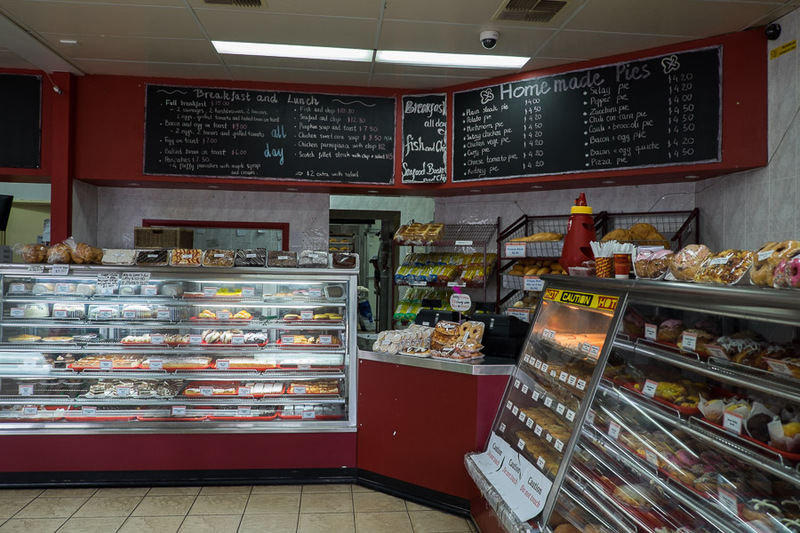 Over a few visits, we tried the chicken and vegetable pie, steak and mushroom pie, cauliflower and broccoli pie, pizza pie and French vanilla slice. The cauliflower and broccoli pie was surprisingly awesome – like cauliflower and broccoli cheese in a pie crust. 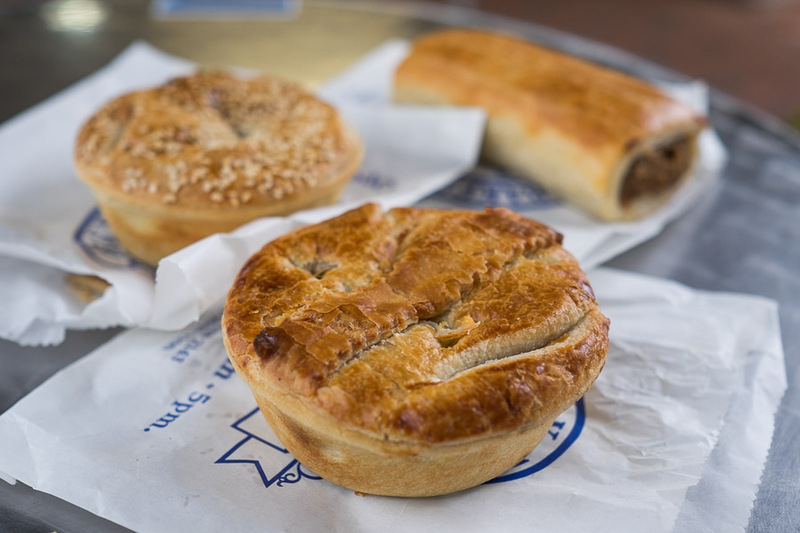 The pies were decent, and the opening time was excellent for us hungry early birds. 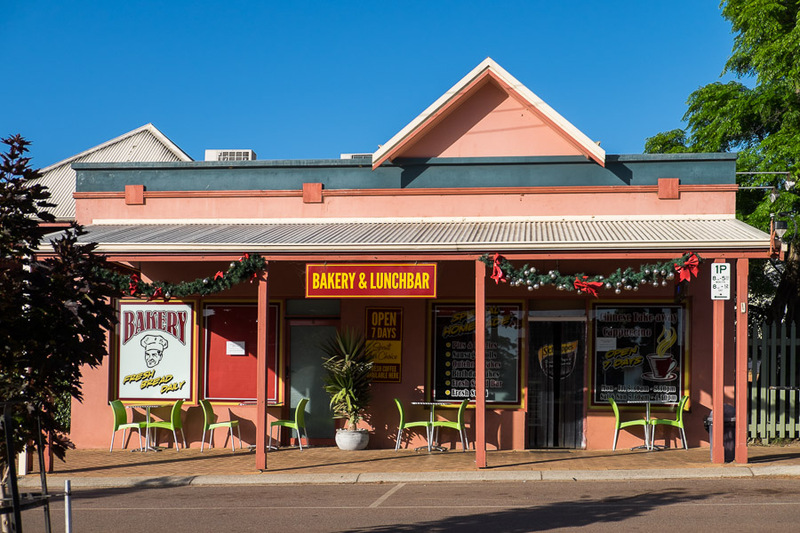 According to Jac, the pizza pie (AU$4.50) was good, but her favourite pizza pie is still the one from Dongara Bakery. 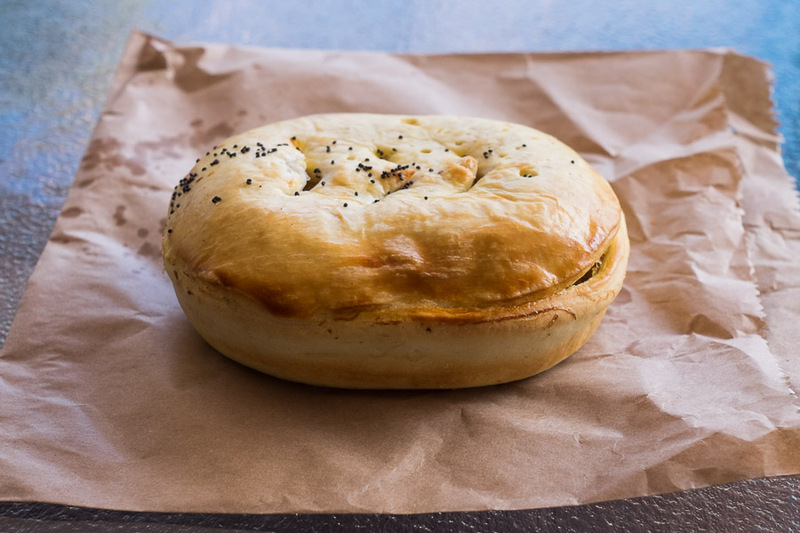 Chicken and vegetable pie (AU$4.20)- filled with chicken, potatoes, carrot and peas. 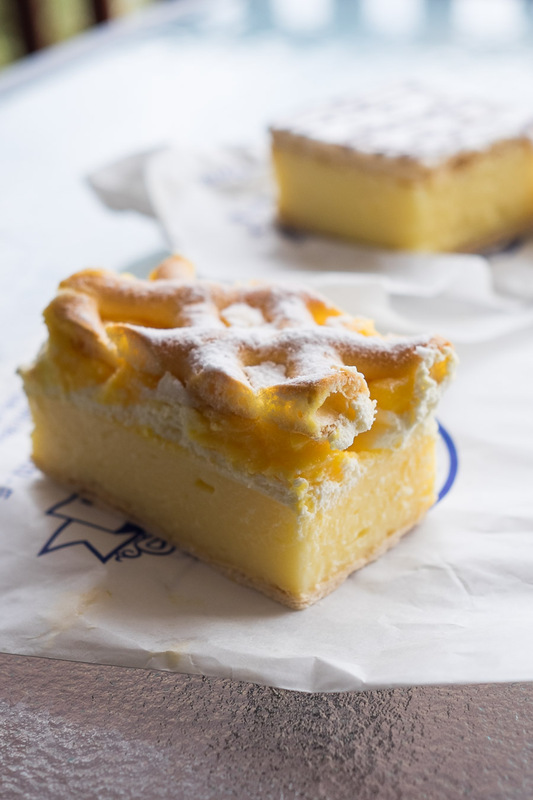 The French vanilla slice (presumably ‘French’ due to the layer of creme Chantilly above the custard) was delicious – that extra sweetened cream made all the difference. 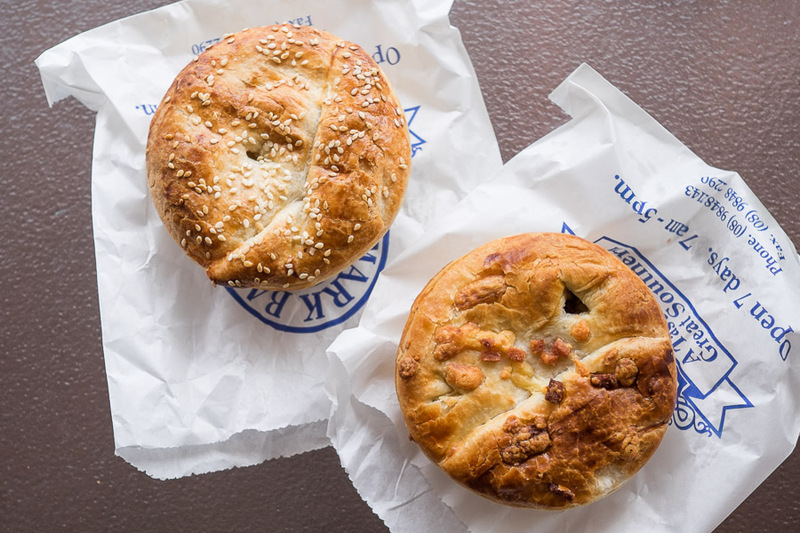 The Denmark Bakery has won numerous prizes at the Perth Royal Show and was winner of Australia’s Best Pie Competition in 2012/13. The pie pastry here had a more buttery taste compared to the pies across the road at the Strickland Bakery – you can clearly see/taste why they’ve won so many competitions. They cost a little more than the Strickland Bakery pies too (worth it, I reckon – though I was happy to eat pies from either bakery). 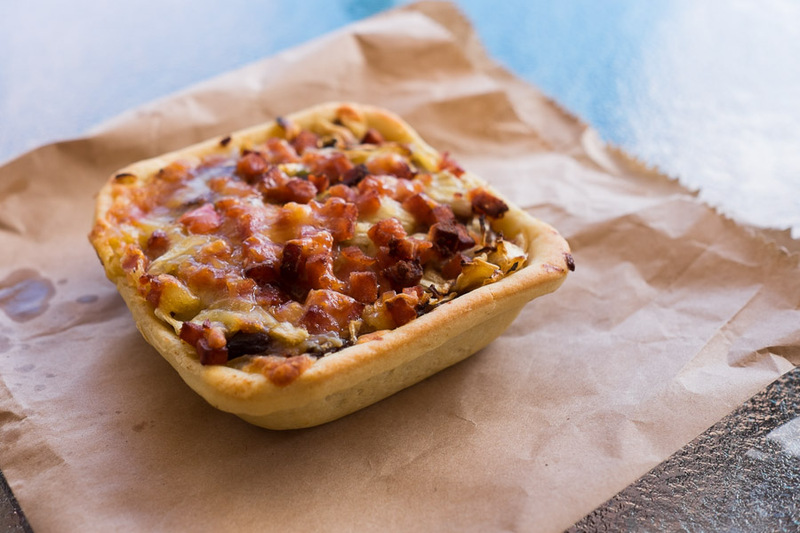 I enjoyed Denmark Bakery’s chicken and vegetable pie so much I had it again on my second visit – crisp pastry and a savoury gravy of perfect consistency with chunks of chicken, mushroom and peas. 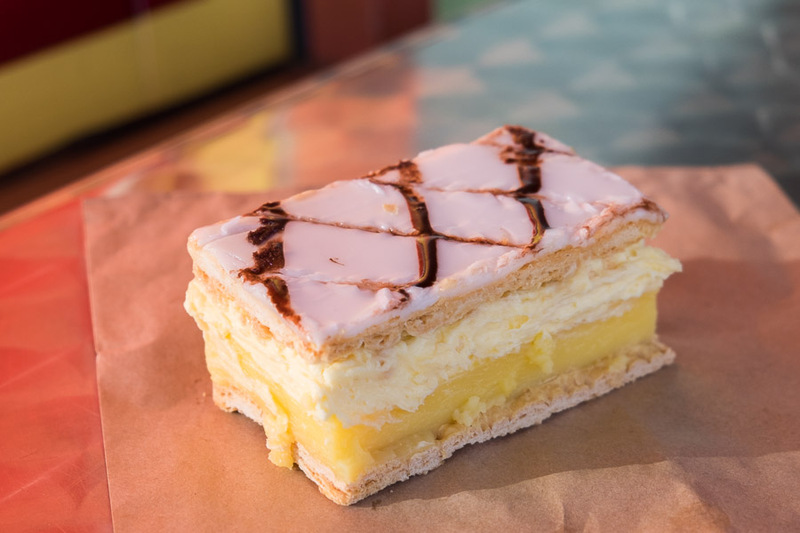 While the French-style vanilla slice of Strickland adds the layer of creme Chantilly, this classic custardy snot block was perfectly executed. 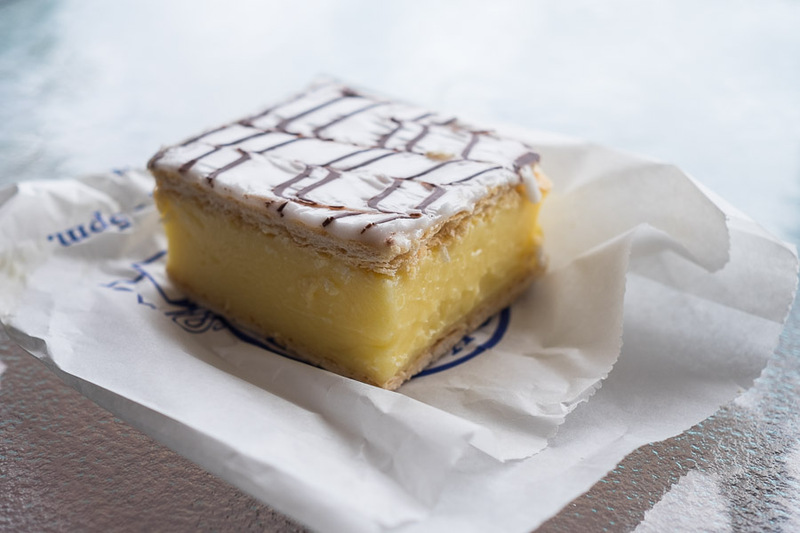 If I could add that extra layer of creme Chantilly to this vanilla slice, it would be amazing. My chicken and vegetable pie (AU$6.60) . 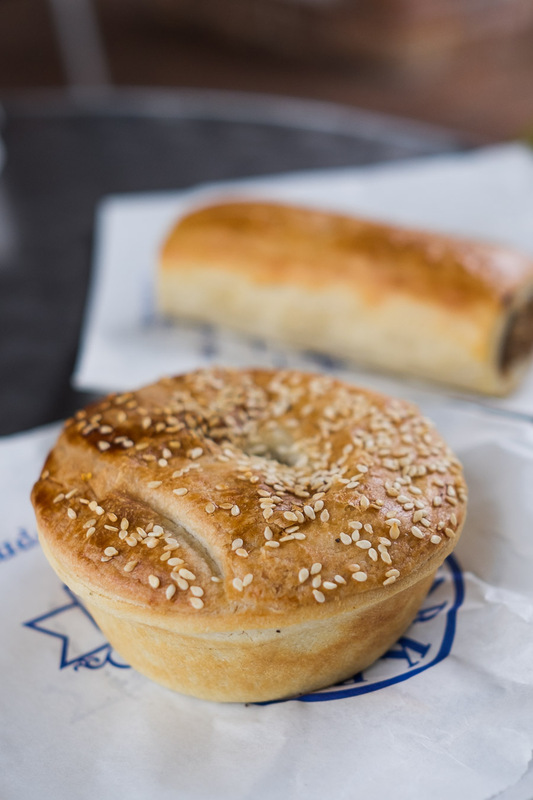 In the background, a plain sausage roll (AU$4.50). We deliberately avoided making restaurant reservations in advance so we wouldn’t have to commit to a predetermined schedule, but of course during the busy holiday season this limited our options for dining at the most popular of Denmark’s winery restaurants – the highly recommended Kirby’s restaurant at the Rickety Gate winery was booked out, for example. A really good pub meal. We ordered at the bar and sat outside on the verandah. The music blaring from the speakers was a touch too loud, rendering the tables closest to the tables unusable – people would wander out with their drinks, sit there for a few minutes, realise the music was drowning out the conversation, and get up to find a different table. 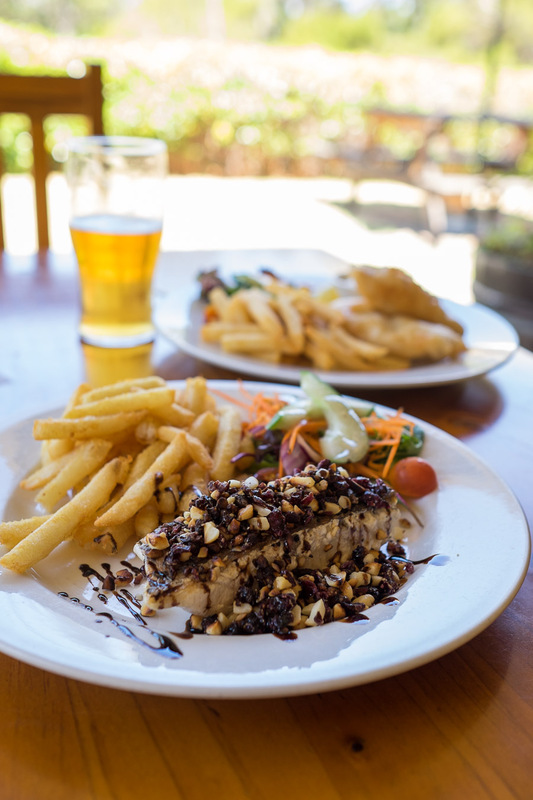 My fish was beer-battered, Jac’s encrusted with macadamias, both cooked beautifully. The fish was placed on the plates next to the chips, not on top of them – thank you, chef! Long-time readers will know how much I detest chips rendered soggy by meat or fish sitting on top. Side-by-side placement may appear less fancy on a restaurant plate, but I choose simple and practical any time for maximum enjoyment. Service felt somewhat chaotic initially when we walked in for a late lunch, but things settled down after we ordered our drinks and food. 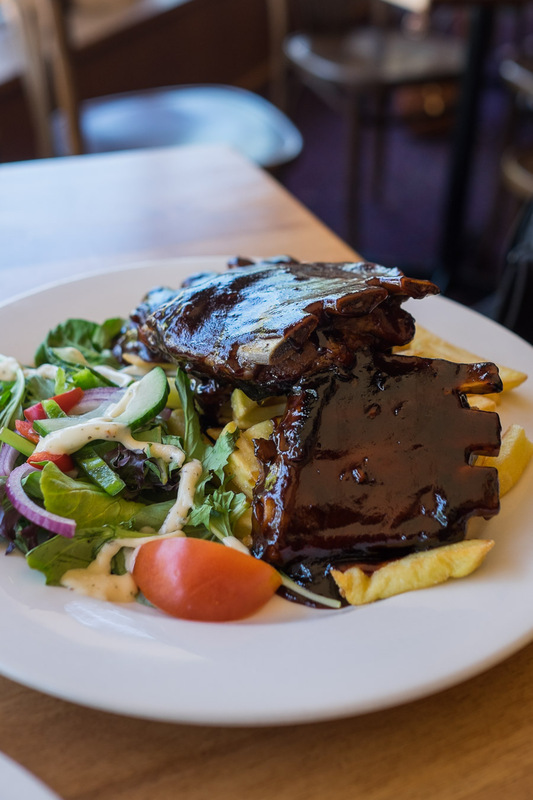 Nothing to get excited about – but it did the job, though when you look at the pictures you’ll spot the meat sitting on top of the chips – the first thing I did after photographing my plate was rearrange my steak and chips. My sirloin was a little overdone for medium but still juicy, with a fantastically charry crust – I devoured it all and enjoyed it. The mushroom sauce was thick and beefy, great for chip dipping. Jac’s pork ribs were sticky sweet and saucy as promised, and finger-sucking good. 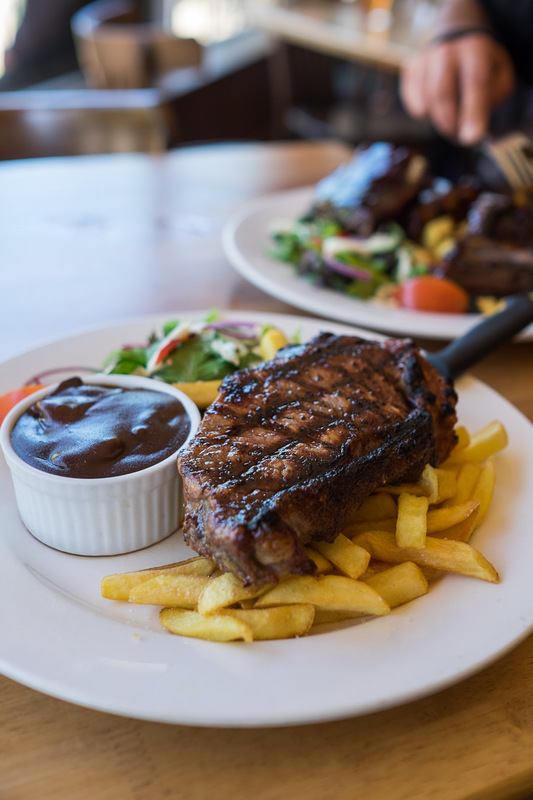 Sirloin steak with chips and salad and choice of sauce – mushroom, pepper, Dianne, garlic or red wine jus – I chose mushroom. 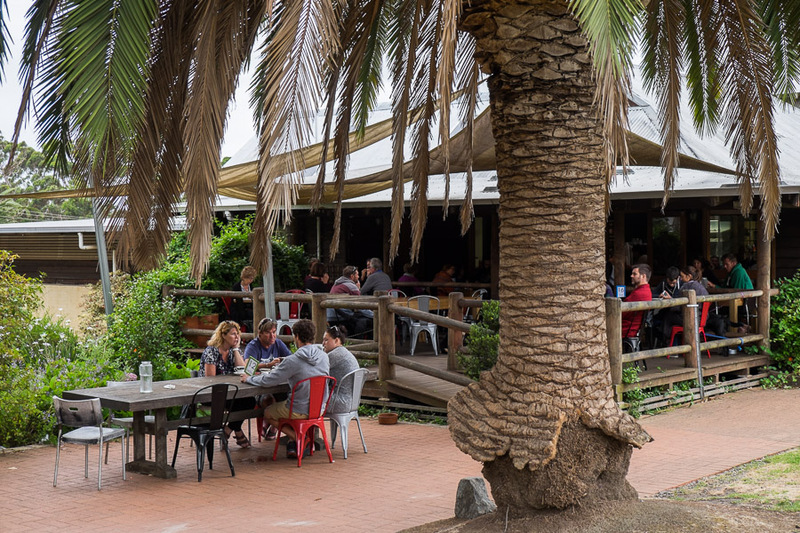 We knew from our research that the menu at Old Kent River Cafe is small; you basically have a choice between local marron or lamb. Jac chose marron with salad, seafood sauce and fresh lemon. For $36, you get approximately 250 grams of marron (live weight) which in this case worked out to be three marron in their shells. 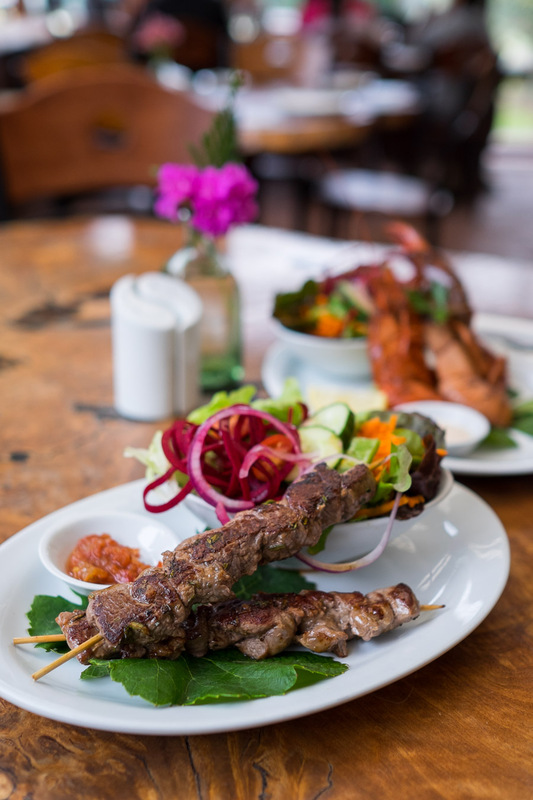 The organic farm-reared lamb is flavoured with rosemary, cooked and served on skewers. I chose two lamb skewers with salad and Old Kent River tomato relish (AU$28). The meals aren’t cheap for what you get on the plate – the salad portion is generous, but you know… it’s salad. Dining is out on the patio with garden views, and next to the patio is the Old Kent River Wines cellar door/shop, where Jac placed our lunch order, tasted a few wines and bought a bottle of pinot noir. Beside wine, there are preserves, pickles, relishes and chutneys for sale, and you can buy fresh berries, organic veggies, and live and cooked marron to take away too. 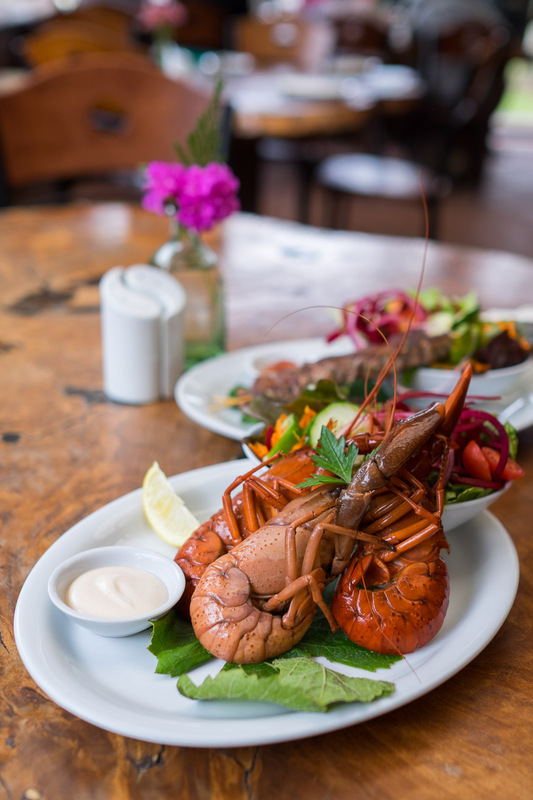 Marron and salad (AU$36) with seafood sauce and lemon – be prepared to get dirty if you want to extract every bit of flesh out of the shells. 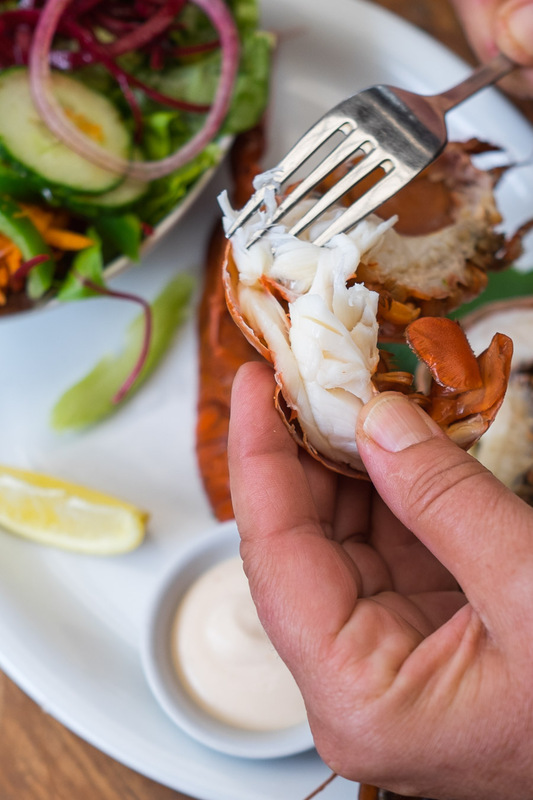 A lobster cracker was provided but I reckon with smaller beasties like marron, one of those metal seafood picks is just as essential for poking out every last bit of meat from the shells. 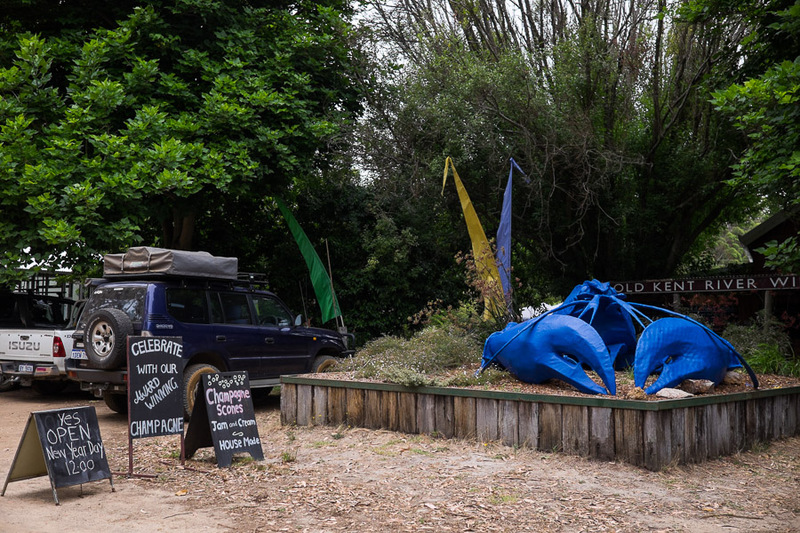 You can’t miss the big blue marron at Old Kent River Wines. 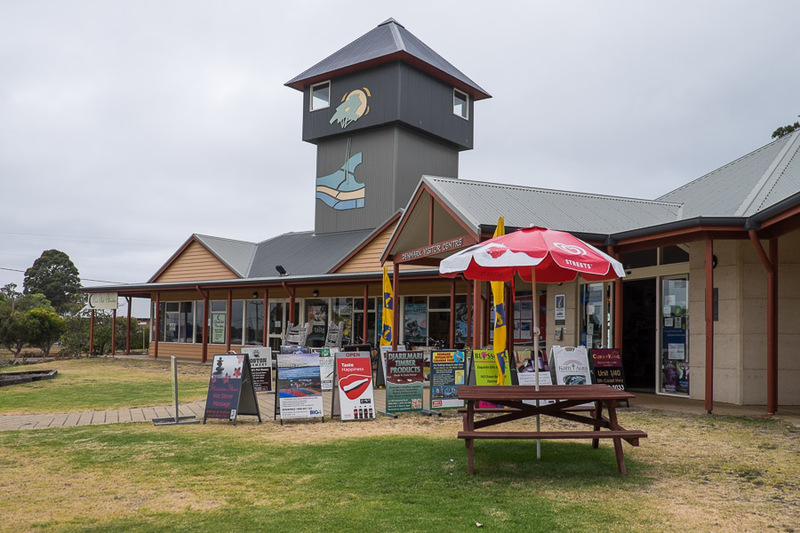 Most of our travel research is done online, but we also like to drop in at the local visitor centre (when there is one), in case there’s information not available online. You’ll find the usual collection of glossy brochures, souvenirs and friendly staff to answer your queries, but thing I found most useful was the big board on the wall – ‘Where to eat in Denmark and surrounds’ (wineries, restaurants, cafes and takeaways), including days open and whether they do breakfast, lunch and/or dinner. The visitor centre staff actively encourage visitors to take a photo of the board for easy reference, so go right ahead and do it. Inside the Visitor Centre building is Dark Side Chocolates, accessed via a glass sliding door. 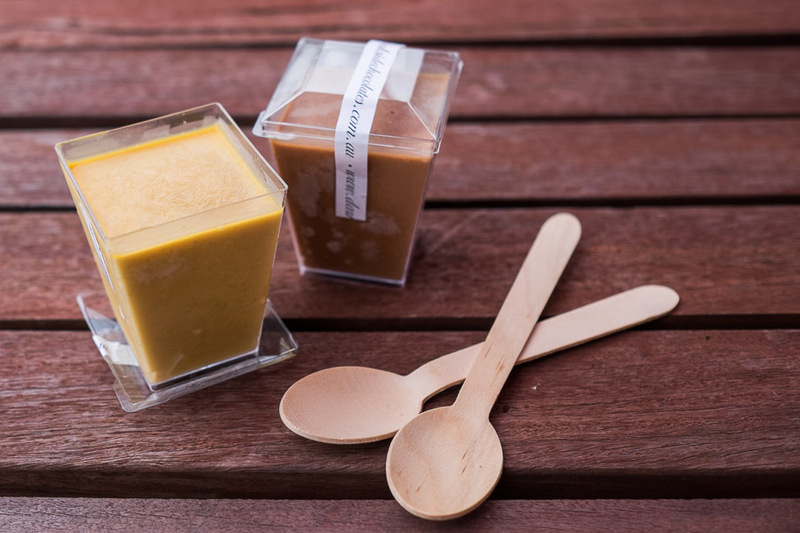 We bought a lovely box of handcrafted chocolate truffles for Jac’s mum and enjoyed Dark Side’s gourmet ice cream ($5 each) – salted caramel for me, and malted milk chocolate for Jac. Jac’s malted milk chocolate was like a very rich and creamy iced Milo. The caramel could’ve been a touch saltier but it was gooey and decadent, and I didn’t want to share. 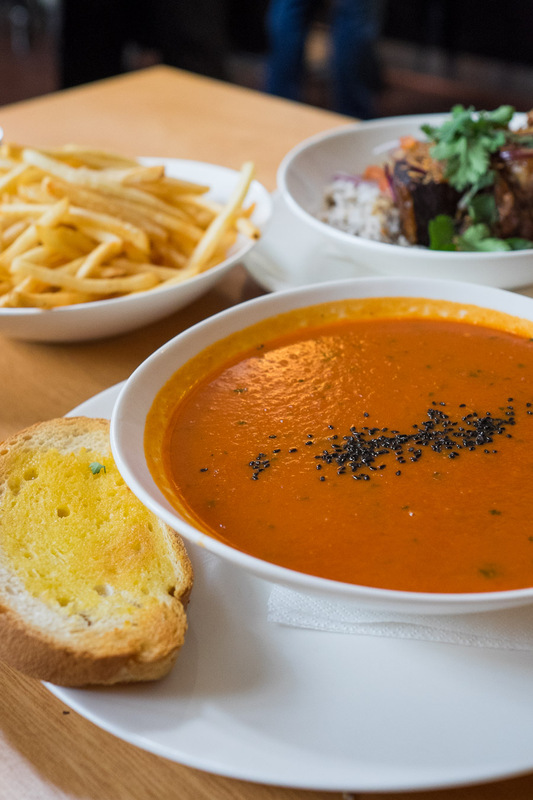 We enjoyed our food at Mrs Jones – the tasty beef short rib and ginger rice (though to be honest I couldn’t detect ginger), soup of the day (an excellent tomato, garlic and basil) with toasted bread, and crisp shoestring fries. But we waited a very long time to get it – when I placed our order, I was warned there would be a 40-minute wait for food orders, and in the end, it took a little over an hour. I’m not sure if they were just having a bad day or if this happens regularly during peak times, but I’d be reluctant to return if it meant another long wait for food. 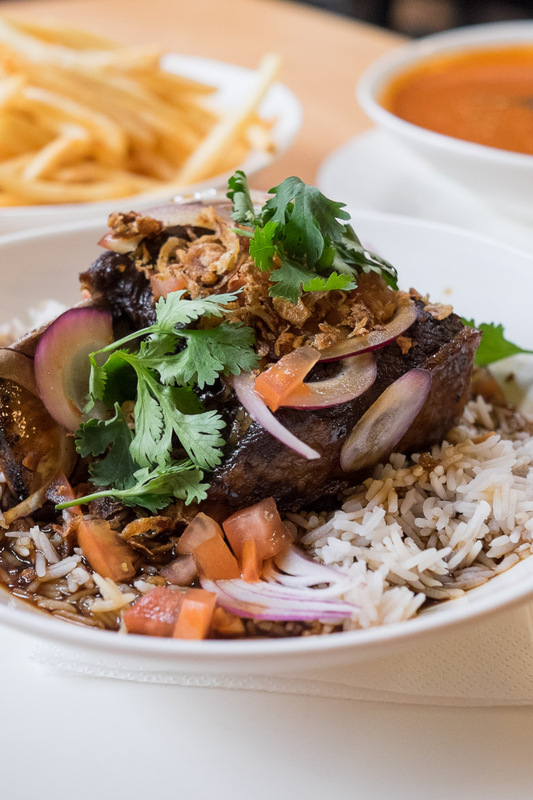 Sticky beef short rib (AU$19) cooked with Asian flavours including soy and fragrant five spice, topped with crispy fried shallots. Soup of the day (tomato, garlic and basil) with toasted bread. It was a nice big bowl for the price (AU$14). With playground equipment and picnic benches in a large grassy outdoor area, Boston Brewery was clearly the place to go for families with kids and dogs. There is ample parking. I think at the peak of holiday season we ended up in the overflow parking for the original overflow parking area. The place was absolutely pumping, with long lines at the bar to get a drink, and even longer lines to order food – long lines due to the sheer number of people, not due to a lack of efficiency – Jac hit the drinks line and I joined the food queue. There were no free tables inside, so once our food order was placed, we took our drinks, cutlery and ‘table’ number outside where we circled the lawn, feeling increasingly desperate to just pick a random patch of lawn to plant ourselves on (some people who’d clearly been there before had brought their own picnic rugs sit on). Amazingly, under a gazebo in the corner, we spied a lone spare table – ours! Dogs were allowed out here, on their leashes, and we shared the space with a couple of furry friends. My onion crumbed Mount Barker Ranch chicken with corn mousse, polenta chips, coleslaw and ketchup sounded great but everything on the plate was disappointingly bland, the chicken breast overcooked and very dry. There was plenty of beef in Jac’s teriyaki beef salad but at least half of it was much too chewy. 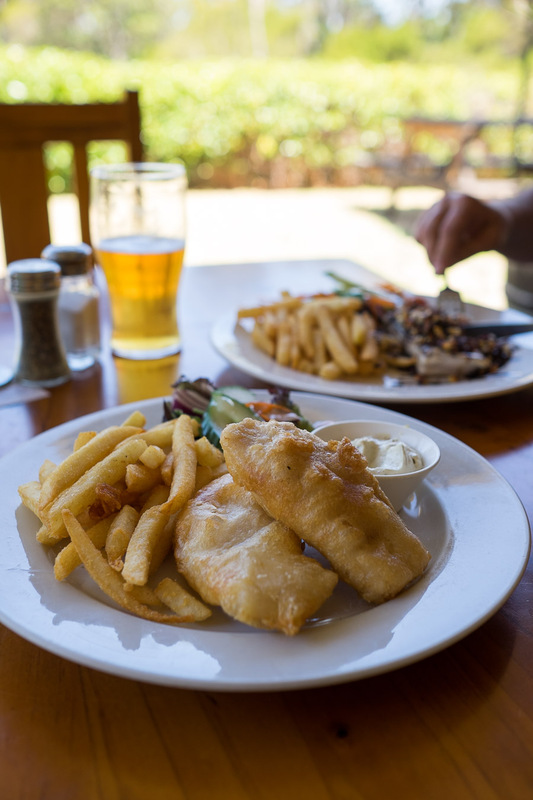 As we picked on our food, we saw many Brewer’s Paddles (fish goujons, cacciatore, cured ham, tamarind chicken wings, shark bay prawns, and flat breads with the dip of the day), fish and chips, and pizzas being delivered to tables/picnic rugs. Did we just order the ‘wrong’ dishes? If there’s a next time, I’ll test that theory. 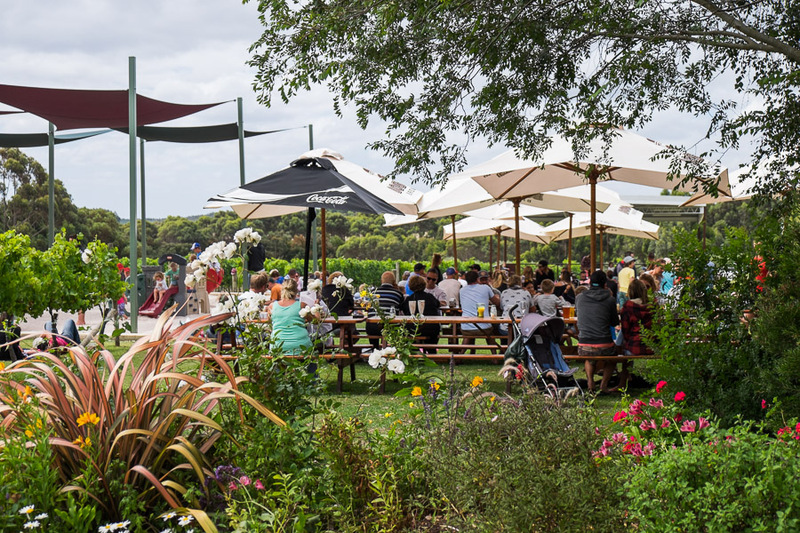 Located at Willoughby Park Winery – too busy that day, we didn’t stick around for a tasting. 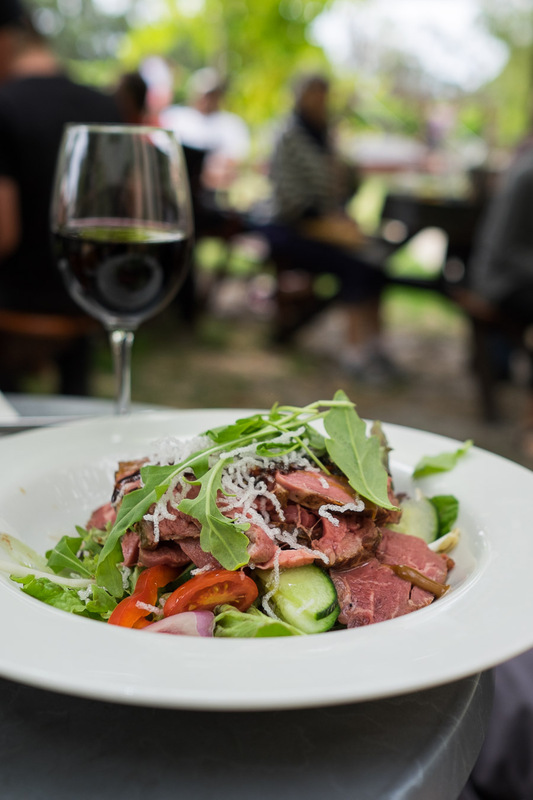 Teriyaki rare beef salad (AU$28) with bean sprouts, capsicum, red onion, coriander and sesame dressing. 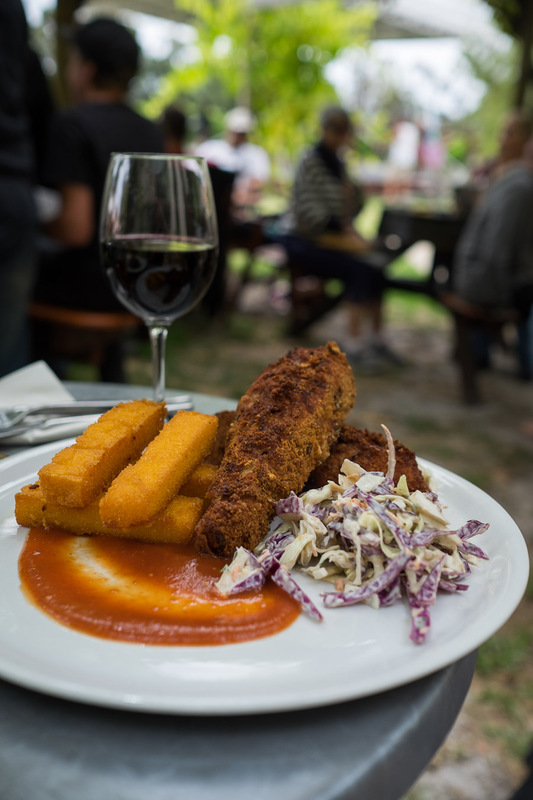 Onion Crumbed Mount Barker Ranch Chicken (AU$32) with corn mousse, polenta chips, coleslaw and ketchup. On our last morning in Denmark, we had breakfast at the Bibbulmun Cafe. I didn’t enjoy my burnt coffee and left most of it in the cup, but my Bib Brekky was one of the most generous fry-up plates I’ve been served in a long time, and Jac proclaimed her Benedict Brekky a decent rendition of eggs Benedict that she’d be happy to order again. We sat at a table outside and watched the town come to life. 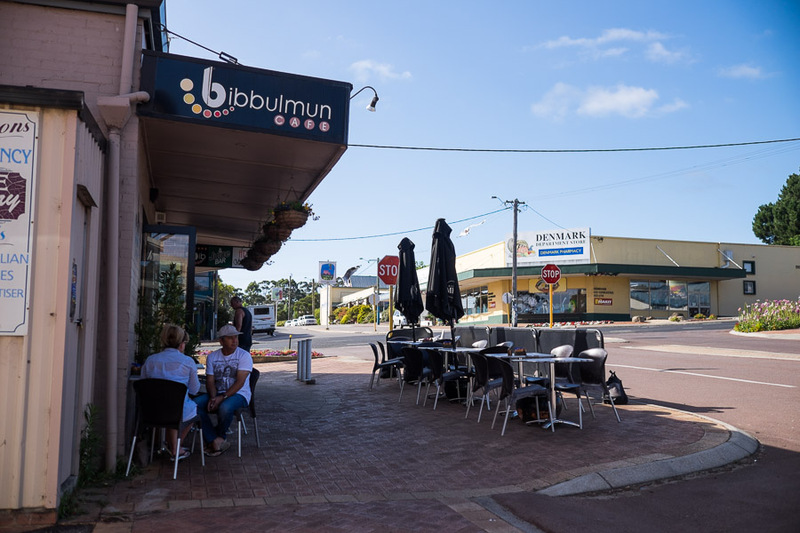 Not keen on the coffee, but yes – I’d have breakfast again at the Bibbulmun Cafe. 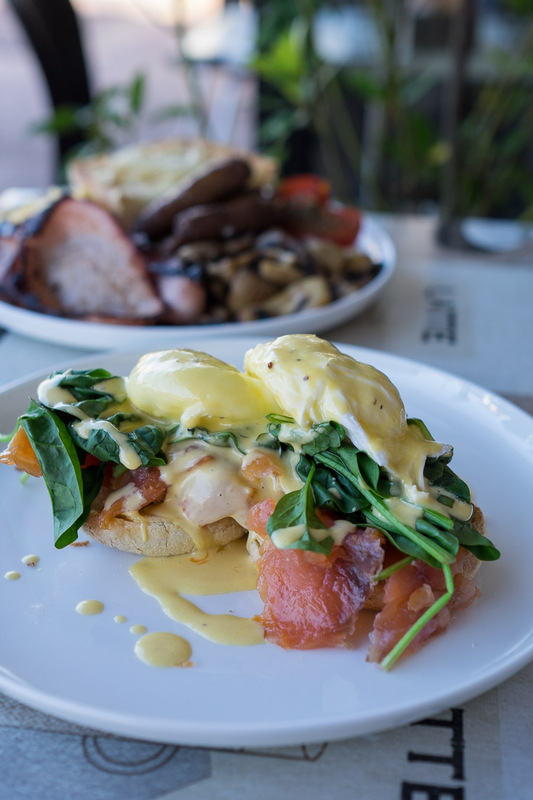 Benedict Brekky (AU$16.50) – poached free range eggs with smoked salmon, wilted spinach on toasted muffin with house-made hollandaise. Instead of smoked salmon, you can choose ham or bacon instead (AU$15.50). 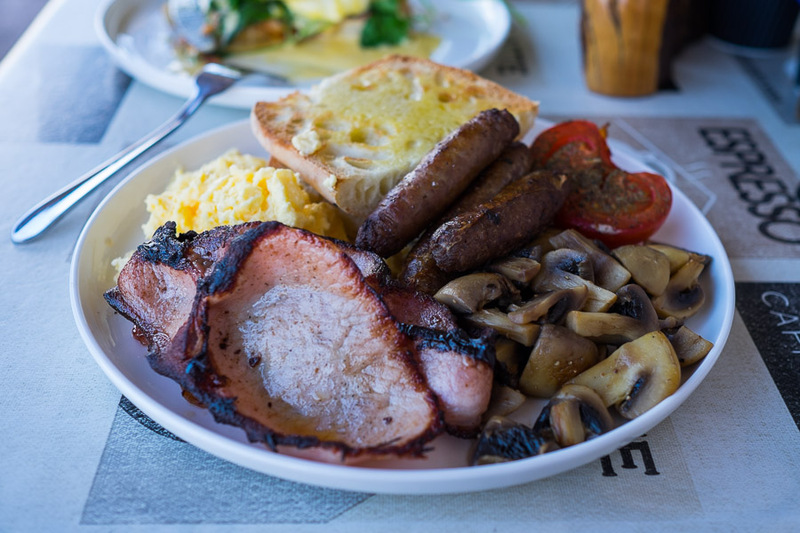 The Bib Brekky ($18.50) – bacon, free range eggs, sausages, roasted tomato, boozy mushrooms and Turkish bread. As mentioned, we didn’t want a structured itinerary for this holiday, and so didn’t make any restaurant bookings. We got right into relaxing mode and realised we just weren’t in the mood for the formality of multi-course restaurant service. Besides, as this was my first time (and won’t be my last time) in Denmark, everything was interesting and worth checking out at least once. 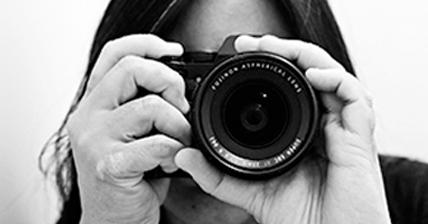 And this was a true holiday – yes, I’ve blogged it, but our enjoyment came first and foremost, not consideration of blog content. 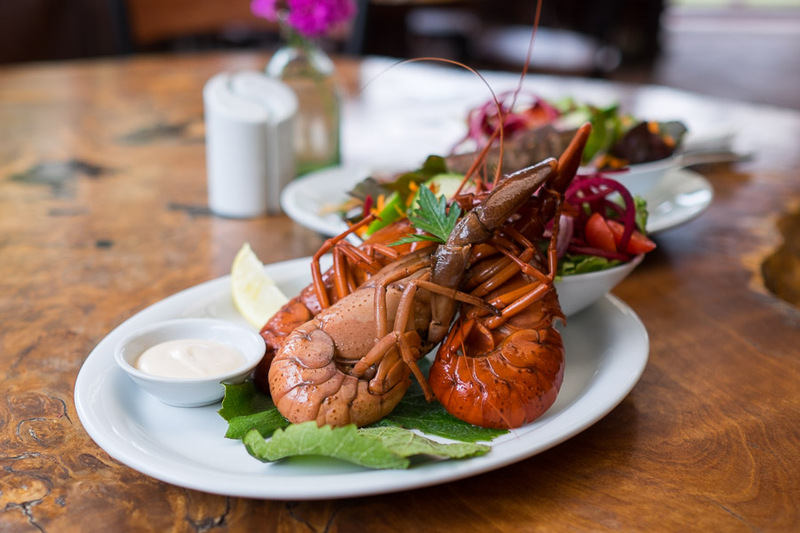 I had no intention of writing a guide on ‘Must-do things in Denmark’, or ‘Where to eat in Denmark.’ That kind of blogging doesn’t interest me at all. So there was no need to chase ‘the best’ (and what’s ‘the best’ anyway? Everyone has their personal favourites). Overall, we had a wonderful time in Denmark. I loved going on walks, eating (too many) bakery pies, staying at the Rivermouth Caravan Park, helping Jac prepare meals in our kitchen, and eating meals on our veranda. Looking forward to the next visit. Maybe a winter break, when it’s not so busy.